Inspired by the rare medical condition “Locked-in syndrome”, in which a patient is fully aware but cannot move or communicate verbally due to complete paralysis of nearly all voluntary muscles in the body except for the eyes. Locked In is a multidisciplinary, physical performance exploring human connection, communication and our sensory and extrasensory experience of the physical world. 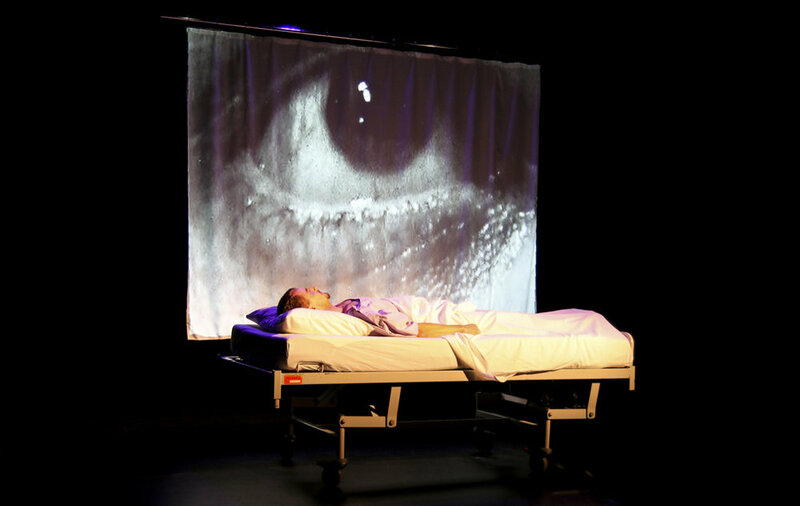 The piece is inspired by the novel The Diving Bell and The Butterfly by Jean-Dominique Bauby and will fuse physical performance, sound and projection and other digital effects. Produced by Shock Therapy Productions, Locked In is a collaboration of International artists . Directed by: VERONICA NEAVE. Created and Written by: VERONICA NEAVE AND SAM FOSTER. Starring: SAM FOSTER AND JOHANNE FOSSHEIM. Please contact us for more information.